This tranquil hideaway, set on a 240-acre horseshoe shaped private island, epitomizes the breathtaking beauty of the South Pacific. Crafted from local hardwoods, bamboo, lava rock and coconut palm thatch, nine authentic Bures and three unique Treehouses offer a harmonious balance between nature and contemporary elegance. The resort is surrounded by lush tropical gardens yet situated only steps from a beautiful white-sand beach. 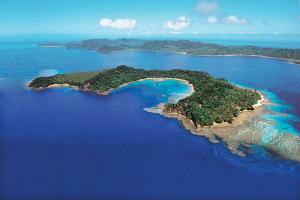 Matangi Island Resort is a magical 240 acre private island only 6 miles off of Taveuni. Diving, Snorkeling, Sailing, Fishing, Hiking.